You can answer the phone without interrupting what you are doing - whether you are cooking, cleaning, or surfing the Internet. This is one of the best selling Telephones in store. 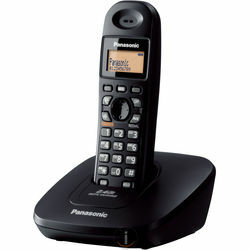 Buy Panasonic KX-TG3611 Cordless Landline Phone at lowest prices only on Infibeam. View more design and get incredible discounts. 2.4 GHz Frequency Hopping Spread Spectrum (FHSS) TechnologyFHSS technology provides clear sound over longer ranges, as well as digital security to prevent eavesdropping.Digital Speakerphone (Handset)You can answer the phone without interrupting what you are doing - whether you are cooking, cleaning, or surfing the Internet.Light-Up Indicator with Ringer Alert (Handset)The indicator on the handset lights up in amber when there is an incoming call for visual confirmation.Convenient AAA (R03) Ni-MH Rechargeable Battery (Handset)Since AAA-type rechargeable batteries are used, you can replace them with two commercially available AAA batteries for added convenience. (Rechargeable Battery: HHR-4MRT)Illuminated Display (Handset)Whenever you get a call or touch a key, the LCD&s backlight lights up, so even in the dark you&ll be able to see who&s calling and easily operate the phone.50-Name & Number PhonebookUp to 50 station names and numbers can be stored in the built-in phonebook for fast, easy recall. Caller ID with 50-Name & Number Call LogThe handset LCD displays the caller&s name and number, so you can see who&s calling before you actually answer the phone.FEATURES Night Mode Ringer ID*1*2 7 Ringer Patterns (3 tones, 4 melodies) 5 Redial Memory Any Key Answer Clock / Alarm Handset Locator (Base Unit) 11-Day Standby Time 5-Hour Talk Time 7-Hour Charge Time Wall Mountable (Base Unit) This is one of the best selling Telephones in store. Buy Panasonic KX-TG3611 Cordless Landline Phone at lowest prices only on Infibeam. View more design and get incredible discounts.